The ethanol leader had a depressing month, but shares are still up considerably this year. 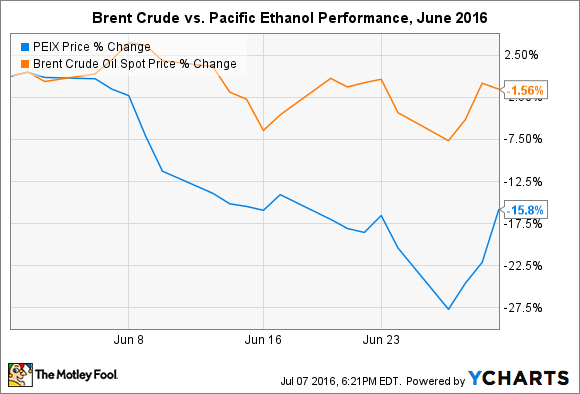 What: Shares of Pacific Ethanol (NASDAQ:PEIX), one of the nation's largest ethanol producers, dropped nearly 16% in June; but as the chart below demonstrates, it could have been a lot worse. The company's shares were down 28% at one point following a steep decline in crude oil prices before sharply recovering at the end of the month. So what: It's no surprise that ethanol prices are directly influenced by crude oil prices, so any correlation between Brent crude and Pacific Ethanol shares is not a mistake. Of course, that doesn't explain everything. Investors may remember that May was an extraordinary month for the company's shares, which cruised 40% during the period. The decline in June could simply be viewed as a "cooling off." Indeed, from the beginning of May to the end of June, Pacific Ethanol shares are up over 20% -- not bad considering the S&P 500 is flat over the same period. There was also some mixed news about the ethanol market released last month. April exports soared to 96 million gallons, but optimism was doused by May's export volume of only 56 million gallons. American producers have been eyeing international sales for stable, long-term growth for several years. While recent annual trends are favorable, and some choppiness is to be expected, the wild swings prove we're not quite there yet.